Ningbo Turando Electric Co., Ltd.
Ningbo Turando Electric Co., Ltd. is an energic and excellent team in China. Ningbo Turando Electric Co., Ltd. is a high-tech enterprise dedicating to R&D, manufacturing and sales espresso coffee machines. It is also one of the earliest established and mature company specializing in capsule coffee machines in China. The company has a long term practical operating experience in exporting capsule coffee machine and related products, including Coffee Grinder, Milk Frother, Capsule Holder and etc. We always get worldwide customer’s good comments for the excellent quality and best service from coffee roasters and retailers. Turando locates in the Hangzhou Bay New Zone, Ningbo City, which is famous as “China's Hometown of Electric Appliance”. The company covers an area more than 1500㎡ office zone and more than 20000㎡manufacturing plants. We participated in many famous design competitions in the past years and got good achievements, such as IHA (America), IF and Red Dot(Germany), Compass d`Or(Italy). With many years great efforts of Turando people, the company are ascending in the leading position in this field. At the same time, Turando is aiming at “Ensure all the consumers a healthy, comfortable, convenient and modern kitchen life. Tcofi brand is already the trendy’s favorite. The company strictly comply with our policy “Professional, Innovation, Sincerity, Result“. We constantly develop and innovate coffee machines and insist on the motto” technology is our heart, the quality is our life, and the client is the God”. We supply the affordable automatic coffee machines, high quality industrial design& reform and best service to our users with heart and soul. Currently ,Ningbo Turando Electric Co., Ltd. is one of the most influential companies in researching and manufacturing coffee machine in China. With constantly pursuing the quality and innovation, Turando would be lead the trend of appliance in the near future. Q:What are Turando product lines? Q：What’s your core competition power? The company pursues the policy of strict employee to keep the team high diathermy. Profession education and training chances are provided to make the team perfect and all staff members work with passion. As for products, we pay much more attention to the deeper technology innovation rather than just only the appearance and structure, including new material adoption, major function innovation, mechanism system, intelligent control, etc. As for the internal management, we insist on pursuing revolutionary management and creative system, which enables to improve the efficiency, competitiveness and service. Satisfy all clients with comfortable service, production project and conversation project is our main policy. “Better ourselves, better the world” is the slogan of our company whit an understanding:constantly make process, improve ourselves,team work and offer good service. We keep learning everything new to try to be among the leading level in the industry in order to be competitive in the world market for long. -- We concentrate on the industry of electric and electronic, provide kinds of electric appliances, as well as product design, safety approval consultant, shipment inspection, logistics service, a total solution. The challenge for companies is to bring to the market a stream of new and improved, added-value, products and services that enable the business to achieve higher margins and thus profits to re-invest in the business. Innovation is the successful exploitation of new ideas, incorporating new technologies, design and best practice is the key business process that enables our businesses to compete effectively in the global environment. Try to find out the weakness or disadvantage in the company and improve it by and by to keep the company updated and competitive. -- It's important to have a faith that the power of sincerity overcomes difficulties at work. Maintain the long-term cooperation with our partners. -- Always try our utmost to reduce out cost to keep our customers competitive in the market toga thee with ourselves. Profit also comes from reducing our cost constantly.Try to adjust our direction or working ways promptly to be fit for the market demands or give echo to the customers as soon as possible; try to deliver the goods earlier, try to be efficiency always.Do most efficiency work with a great diversity of methods and rules. 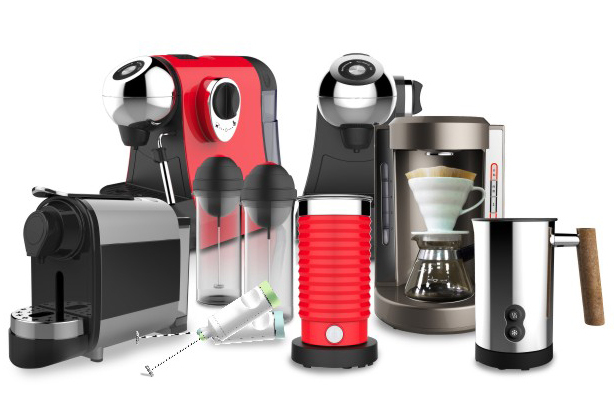 We own more than 50 patents in appearance, practical technology and invention for espresso coffee machines. We design more than 10 icons.